In our house two of the things my family and I love and enjoy to do is both reading and watching movies. And right now over at DK Canada they have books that not only take you behind the scenes of your favorite movies, but at an incredible price with 30% off! We got to pick two books and of course I let my little people do the picking. My daughter's choice was the Disney Fairies Encyclopedia book, which was 128 pages filled with tons of information about all the wonderful characters in the Tinkerbell movie series. Not only does this book share information about all the characters and locations from the movies, but they also share image stills from the movies as well. After about an hour of letting my little fairy check this book out, I was impressed on everything she shared with me and guess what she decided to watch before going to bed that night, Tinkerbell Secret of the Wings since it included not only Tinkerbell, but also her long lost sister, Periwinkle. She was excited to see the characters on the screen and then flip to them in the book to read about them. My son has had an obsession with Disney's Cars since before he was born. Well, maybe it was me that got him started, but he's a huge fan now and even more so after we took him to Disney's California Adventures to see Cars Land. So when he picked Cars Character Encyclopedia it was no surprise to me. Filled with 144 pages of pure awesomeness that shares tons of information about all 250 different die-cast Cars models and also tons of information about the characters from the movie, Cars, helping my son read information he didn't know about was so much fun. His facial expressions when learning something new about his favorite characters just lit up my heart! And it gets even better, the book also included a mini Lightning McQueen toy so he could play with. This went right in his collection with his other Cars that he loves so much. 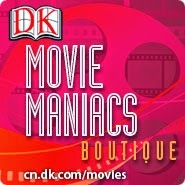 Be sure to check out DK Canada's Movie Maniacs Boutique to get 30% on books from your favorite movies you and your kiddos will love! Disclosure: All opinions are my own. I received the two books mentioned above at no cost for the purpose of this review. No other compensation was received.